Olso: H. Aschehoug & Co., 1993. This is the second Norwegian edition of A Thief of Time. This edition is a part of the Kaliber series and is a reissue of the 1989 edition of Tidstyven that was published by H. Aschehoug & Co. in Olso, Norway. 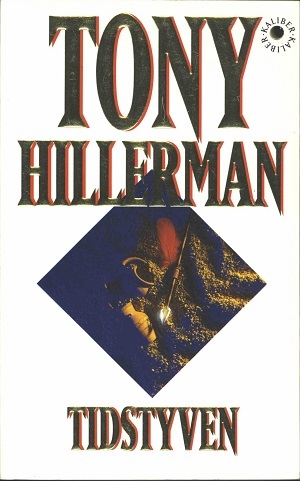 Tony Hillerman's original text was translated from English to Norwegian by Atle Bjørge. The cover illustration is by Tommy Pettersen and depicts broken pottery, a red feather, a spear or arrow all resting on blue tinted sand within a diamond on a white background. There is a hole in the upper right hand corner of the cover with KALIBER written twice around it. Format: Paperback, 18.5 x 11.5 cm. Binding: Full-color paper covers with the author, title, and series logo printed vertically on the spine.